Wednesday was also the Aggies first win at the NM State Tennis Center in 2015. NM State improves to 3-10, while the Mustangs fall to 5-9. It was a special day for Aggie men’s tennis, as Seniors Patrick Pfister and Charles Degardin played their final matches at the NM State Tennis Center. The Aggies got things started by claiming the doubles point. Juniors Paul Denele and Thomas Douglas teamed up at the No. 1 doubles’ spot to claim a 7-5 victory over Tristan Da Lio and Vladimir Gnilozbov. “It was good to see (Denele) win his doubles and singles matches today,” Vargas said. At the No. 2 doubles spot, Degardin and Charles Baron defeated Pablo Santibanez and Alvarez Nunez, 6-1, to clinch the doubles’ point for the Aggies. In singles, NM State collected five of the six singles matches. Denele, Pfister, Degardin, Christofer Gonclaves and Liam Goldberg all picked-up victories. Gonclaves earned a 6-3, 6-4 victory, Denele won 6-2, 6-7 and Pfister clinched the Aggie victory with a two-set decision over Da Lio, 6-1, 6-4. The lone WNMU point came at the No. 1 singles spot when Juan Pablo Fuentes defeated Strahinja Trecakov in a highly-contested battle that ended 7-6, 7-6. 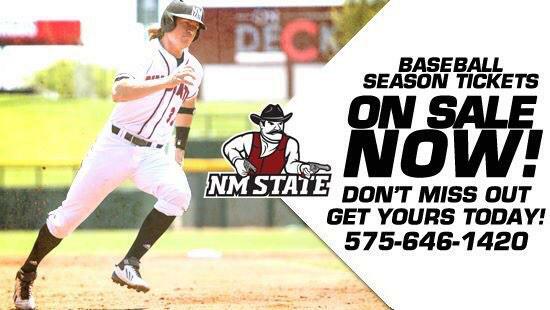 Wednesday was NM State’s fifth consecutive win over the Mustangs. The Aggies will play their remaining nine dual-matches on the road, starting on Tuesday when they travel to San Antonio, Texas to face Alabama-Birmingham. “Now we have to get ready for a long stretch of five matches in seven days on the road,” Vargas said. March 18, 2015 Las Cruces, N.M.